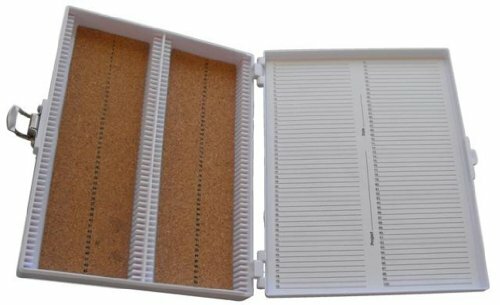 Slide boxes are perfect for storage or transportation of standard size slides. Molded, rigid boxes securely hold slides in grooved slots. Keep boxes safely on the benchtop during use or stack boxes for long-term storage. Each box is secured with a rust-resistant nickel-plated clasp and hinge pin. Each slot is numbered to correspond to the slide inventory sheet on the inside cover of the box. Boxes stack securely on top of each other. White cork lined. Measures 8.25" length by 7" width by 1.3" height. If you have any questions about this product by Heathrow Scientific, contact us by completing and submitting the form below. If you are looking for a specif part number, please include it with your message.